canjo | The How-To Repository for the Cigar Box Guitar Movement! Parts 3 and 4 of the video series “The Essential Canjo” by C. B. Gitty have just been posted here on CigarBoxGuitar.com. These videos dig into the nitty gritty of how to play the canjo: Part 3 shows you tuning and tablature reading, and then moves into playing a couple of songs (Camptown Races and When the Saints Go Marching In) from tablature available on this site. Part 4 then moves into some more advanced playing techniques that you can use to spice up your canjo playing: hammer-ons, pull-offs, vibrato, tremolo and the like. By the time you’ve finished watching all four of these videos, you should be well on your way to mastery of the canjo! 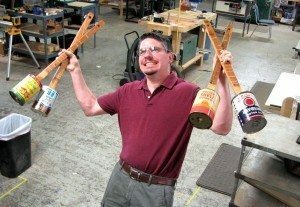 The second part of C. B. Gitty’s video series “The Essential Canjo” has just been added to the Canjos & Diddleybows section of the knowledgebase here on CigarBoxGuitar.com. In this installment, Gitty walks you through the anatomy of a canjo – the various parts and how they are put together, the fretting style, discussion of the “blue note” and more. A number of diagrams and explanatory notes help illustrate the points Gitty is making in the video. Stay tuned for parts 3 and 4 to be posted in the near future, which will cover tuning, reading tablature, playing simple songs, and making use of more advanced playing techniques. Check out the Knowledgebase Post for more info and to view the video! We’ve just added a new post to the Canjos & Diddleybows section of the knowledgebase here on CigarBoxGuitar.com. The subject is Part One of a 4-part video series by C. B. Gitty on the instrument known as the Canjo. If you have ever wanted to know about these fun little instruments, this video series is for you!